“Passengers please be aware that due to the service of remembrance for The 96 delays are likely due the increased volume of people travelling.” The driver’s announcement barely caused a flicker among the people in my compartment. 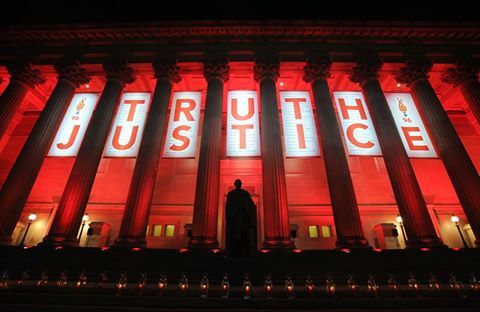 The 96; a phrase burned into our consciousness over 27 years. The train pulled out of Fazakerley and headed into town. The vigil wasn’t due to start for another hour and a half, but I wanted to make sure I was there in plenty of time. It may have only been Wednesday, but already it has been a momentous week and I was weary with emotion. I could only guess at how the grieving and those still blighted by that day must be feeling. The first cracks in the establishment shell, that had encased the truth for over a quarter of a decade, had begun to appear the week before. The jury had sent the Coroner a note. 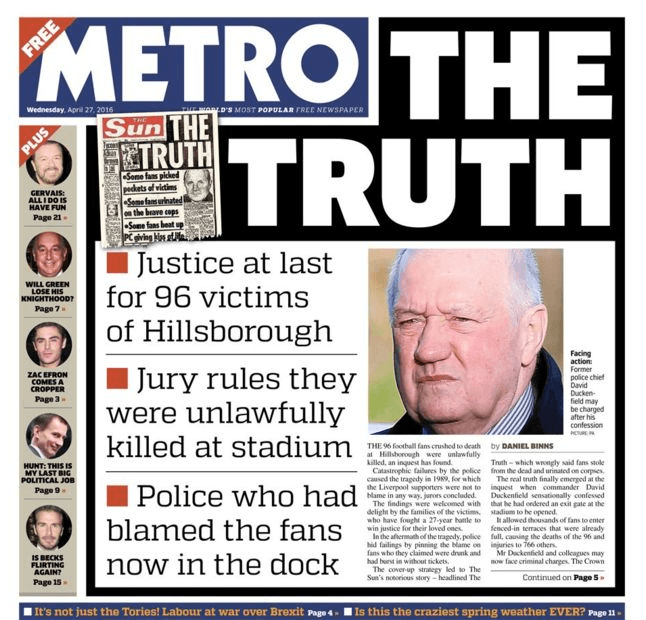 It seemed they had decided that Duckenfield had caused the fatalities by breaching his ‘duty of care’ to the 96; they just couldn’t decide if this failing amounted to criminality. What followed was a weekend of doubt and worry, could they really return another ‘accidental death’ verdict?unthinkable. Then there was the question of the supporters and whether they were to blame in any way; a question that should never have been asked in my view. Should they return a “Yes” to that one, wounds that begged to be healed would be once again ripped open. An unbearable thought. Monday came and we were told a majority of the jury had solved their dilemma, but which way? We would have to wait another day to find out. At least this would allow the families and survivors time to be in court to hear the outcome. We pull into Rice Lane and the carriage begins to fill up, copies of the Metro are all about. The Truth, the real truth, is splashed across its front page. Tuesday, verdict day, had been a roller coaster. I’d been in work for the verdict. Sat at my desk working on emails and a paper, I kept the Guardian’s live feed open in the corner of the screen. I was literally shaking as I awaited the answer to all 14 questions. They came, one by one, like bullets of vindication. I felt elated and my eyes welled with tears. My phone vibrated on the desk next to me as friends shared their relief and joy. My mind travels back to that day again. I am a 22 year old Liverpool supporter who dodged the metaphorical bullet. Mine is an ordinary story, one shared by many Reds. I could have gone. I wanted to go, but I was skint. I was offered a ticket in the week before the semi-final and had agonised over whether to take it. I was on the dole back then. My mind had gone back and forth, but ultimately I passed on the ticket. I knew that might mean also missing the final, but I had no choice. I don’t know who ended up getting that ‘spare’. I don’t want to know. I just hope they got out and I hope they’re okay today. I can’t say I have suffered guilt over the years. I just feel incredibly lucky. Even as I write that I know it sounds terrible, but I do feel so fortunate that it wasn’t me who took the ticket. That I got to grow older and have four beautiful children. That I experienced life’s ups and downs and built a career for myself, free from the nightmares associated with seeing and hearing things nobody should ever experience. When I think of all that has happened to me since that day, it rams home the scale of the loss. Think of the children who may have been born, the dreams that may have been realised, the contribution those 96 and the countless damaged soles might have made to society, had they not been so cruelly let down that day. I’ve been staring out the window lost in thought and suddenly I realise we are pulling into Central Station. It’s packed and I ascend the escalator. Thoughts drift back once more. I’m in my mother’s living room, listening to the build up on Radio City. I can’t remember why I was there instead of in my flat. I’d left home a few years before. Anyway the commentator is saying there is a problem in the Liverpool end. I think it was Clive Tyldesley, but if I’m honest I’m not sure. Then he’s saying there might be people seriously hurt and, did he say supporters may have died? I’m incredulous. Memory is a funny thing. You think it’s like playing back a movie in your head, faithfully reconstructing the past, but it’s not really. It’s more like assembling fragments of a jig-saw and realising some of the pieces are missing and some don’t fit together properly. Nevertheless, I’m sure I remember him saying something about fans forcing open a gate. I’ve since checked and it was him and he did say that. I know he regrets passing on the now infamous lie, passed to him by Graham Kelly, who heard it from Duckenfield himself. How quickly a lie finds it’s way to the public’s ears. The disaster was still unfolding and already the seeds of a 27 year long smear were sewn. It took minutes to implement a cover up, but decades to undo it. British ‘justice’. I take the short walk to Lime St and St Georges Hall. Town has changed so much since 1989, still as I pass our ‘statue exceedingly bare’ and look over at the Adelphi, I’m reminded that some things have a permanence, and enduring quality that transcends the generations. Just like the spirit of the people. I recall phoning a mate’s house that evening. His mum answers, her voice filled with expectation, or was it dread. I realise I should never have called her; she was waiting to hear some news herself. I had tried ringing the helpline, but it was permanently engaged. “Oh, I thought you were our Bill”, she said. I sensed a crack in her voice, She’d been crying. She must have told him I’d called, because he phoned me after midnight. He didn’t say much, just that he was okay and thanks for ringing. We’ve since lost touch, but we never spoke about what happened to him in all the years after. I remember also being sat in another friends living room months later. He’d been in the pens and was hospitalised in Sheffield for days after. He’d been visited there by prince Charles and Thatcher and refused to speak to either of them, a fact that filled him, and me, with immense pride. There’s a knock at the door. I answer and it’s two huge fellas. They introduce themselves as policemen from West Midlands. They’re here to interview my mate. They seem to have a script they are working to and they’re interested in drinking and whether he witnessed a criminal offence. I’m furious, but he just answers every question honestly, calmly and with dignity. After they leave I ask him how he kept his cool. “They had their agenda, they already think we are scallies. I just didn’t want to hand them any ammunition.” Turns out they didn’t need any. The story had already been written and the ‘investigation’ amounted to going through the motions. 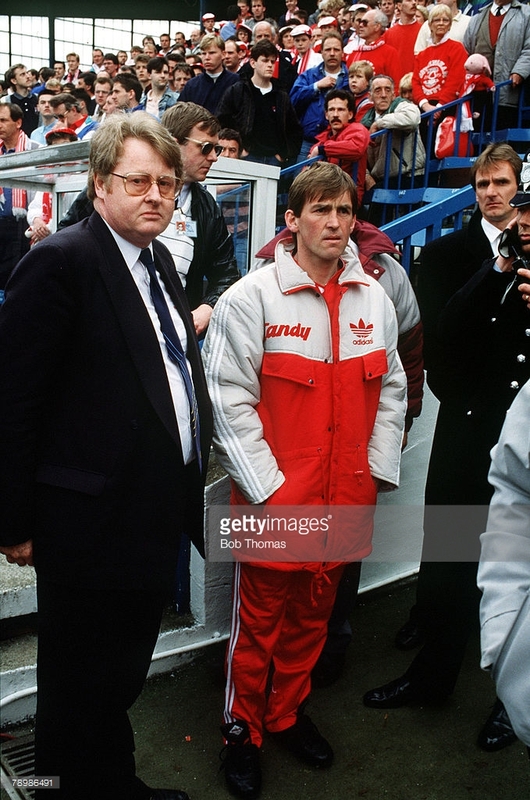 The Liverpool of the 80’s and early ’90’s was in rebellious mood, just as it had been throughout its history. The city had fought Thatcher, with great heroism in my view. It may have ultimately lost that battle, but it felt like the score was now settled. Such a shame she had long since left the battlefield, beyond the long arm of the people. St George’s plateau lay before me, the scene of so many stories down the years. Tales of revolt, commemoration, victory and defeat; of parades and protest. In 1911, transport workers staged a huge demonstration here. Tom Mann addressed a colossal crowd. The police and army would be used against them and there were bayonet charges on Lime St. Scores were wounded. In 1919 The establishment would once again fear that the ‘second city of the empire’ was in open rebellion as the police went on strike, leading to riots and a ‘gun boat’ being anchored on the Mersey; its guns trained on the city centre. In 1971, Bill Shankly addressed an enormous crowd, who had turned out to greet a team who had just lost the FA cup final to Arsenal. In defeat and in victory the city stands together. In 2005 a team representing Liverpool redefined the parameters of a lost cause and were afforded a homecoming fit for kings. Time and again this community has set the benchmark for resistance and defiance. It is often said that Liverpool was an easy target for a state cover up. After all, according to some, here was a city full of angry, rebellious malcontent’s. An enemy within. The Heysal disaster, they must have calculated, provided the perfect cover and allowed many in the media and the public to swallow the lie whole. However, they miscalculated massively. This was absolutely the wrong city to smear, and the wrong mothers, fathers, brothers, sisters and neighbours to pick on. They should have learned the lessons from Liverpool’s history, we would never ever go away. I am near the front of the plateau now and the crowd has grown significantly. I have no idea just how big it is until I get home and watch the news. TV crews weave their way through the throng and beg for interviews. I’m not interested. I see one or two famous faces, but this is a turnout from the whole city; red and blue. Flowers are being passed forward and received by council officials and music blares out from giant speakers; Lennon’s ‘Give me some truth’ and ‘Heart as big as Liverpool’. Then The Justice Collective’s ‘Fields of Anfield Road.’ It reaches the verse “Justice has never been done.” A voice shouts “it has now!” there’s laughter and loud applause. I was here for the vigil in 2012, but this felt different. This was a celebration and a political rally rolled into one. Giant banners hung from the magnificent columns and the face of John Glover, drawn onto a white sheet, wrapped around another pillar, stared out at the waiting crowd. Gone but not forgotten, here to witness a famous victory. The families are greeted as heroes as they assemble on the famous steps, some punching the air, triumphant, others beaming brightly; perhaps for the first time in decades. 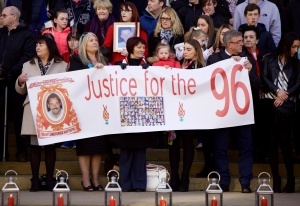 There are banners, proclaiming ‘justice for the 96’, ‘They picked on the wrong city’ and perhaps the most poignant, held by survivors of the disaster ‘Hold your heads up high.’ Vindication and exoneration. Speech after speech tell of a city’s pride and damns those in the media, the establishment and the South Yorkshire Police. They had held their tongues too long, now with the gag removed they let rip and there is no hiding place for the guilty. Joe Anderson, calls for Kelvin McKenzie to be sacked to thunderous approval. 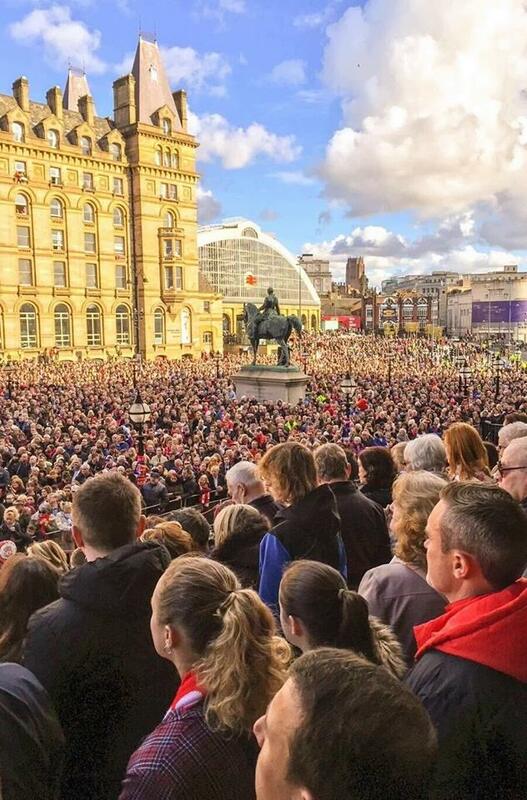 Margaret Aspinall speaks of her pride that it was Scousers once again who had fought to reveal the truth and proclaimed we will again and again and again. Sheila Coleman reflects on a famous quotation, stating evil only prospers when good men do nothing. “Well, we are good men and good women.” She says. “And we did something.” As the evening wound down and the inevitable emotion filled anthem, ‘you’ll never walk alone’, rang out, there was, if not a sense of a journey’s end, at least the feeling that we are one huge step closer to the finish line. Next to me a lad is on his mobile. He’s clearly not from Liverpool. “Of course it’s loud he says. “I’m in Liverpool. I’ve got a headache.” He laughs and then notices that I’m looking at him. His face flushes and he starts stammering. I just smile and look away. He’s right, we do have big gobs, but history has taught us that people only listen when you speak with a loud voice. I leave Wednesday behind and on Thursday I’m at a book launch in the city with my 21 year old son; not even a twinkle in my eye in 1989. The author and many in the room are survivors of Hillsborough. A poem is read with such anger and passion, I’m struck by just how deep the scars of that day are. We leave late into the night and my son comments on how troubled many in the room still are. He’s deeply moved and it’s clear the night affected him more than he expected. “Those lads just went to an FA Cup semi-final 27 years ago,” he said. Yes son, that’s all they did and now the rest of the world knows it too.